he coastline from around Santa Barbara to just south of San Francisco has over the last decade and a half emerged as an excellent alternative to the larger regions on the North Coast and along the Napa Valley for a number of quality wine styles. Production is more scattered but includes some very good cool-climate whites and reds and impressive Rhône styles and Zinfandels. Here, as elsewhere, new and innovative producers are emerging. Prices are rising although only Pinot Noir and Syrah are getting anywhere near the stratospheric levels of the super-premium Cabernet blends on the North Coast. In order to cover the remainder of California’s wine growing areas Central Valley and the Temecula region to the south of Los Angeles are also included in this section, as well as the far superior wines of Amador County, Livermore Valley and the Sierra Foothills. Santa Barbara County is to the north of Los Angeles and follows the coastline embracing the regional AVAs of Santa Maria to the north of the county, Santa Ynez and the recently established Sta. Rita Hills. 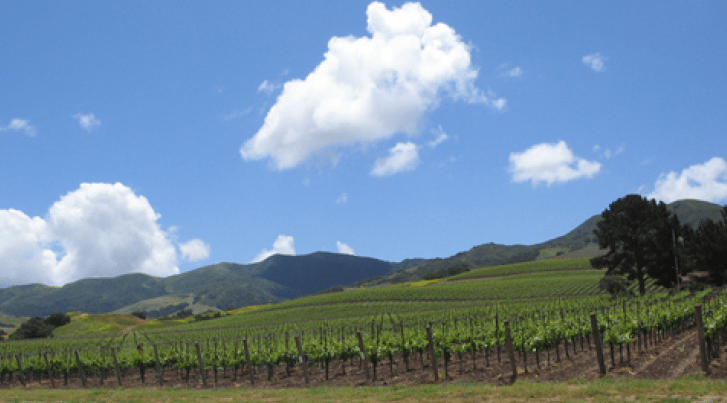 Santa Rita, located between the towns of Lompoc and Buellton, includes the great Sanford and Benedict Vineyard within its boundaries. This is an excellent source of top Pinot Noir and Chardonnay and is notably affected by cooling sea breezes – more so than the neighbouring Santa Ynez Valley, which is further inland. The coolest western sectors provide ripe, tropical Chardonnay, while further east some increasingly impressive Syrah, Grenache and white Rhône varieties are grown, as well as Cabernet Sauvignon and Merlot. To the north of the county the Santa Maria Valley provides some of the best Pinot Noir in the state and some excellent Chardonnay. Pinot Blanc and Syrah are also successful here. The northern tip of the Santa Maria AVA lies within San Luis Obispo County, which stretches northwards along the coast and a considerable way inland to north of Paso Robles. Four AVAs are contained within its boundaries. Arroyo Grande and Edna Valley are both relatively cool. The former is a fine source of Chardonnay and Pinot Noir, whereas the Edna Valley has also provided some excellent Rhône styles and Sauvignon Blanc and Sémillon. Further to the north Paso Robles is warmer and the wines are fuller and riper in style. This is generally red wine territory with very good Cabernet Sauvignon, Merlot, Zinfandel and Syrah. There are also white Rhône varieties planted closer to the ocean along with good Chardonnay. York Mountain to the west of Paso Robles is also cooled by altitude. This extensive area gives its name to an AVA that stretches down from the coast at the town of Monterey along the Salinas River valley almost to Paso Robles. 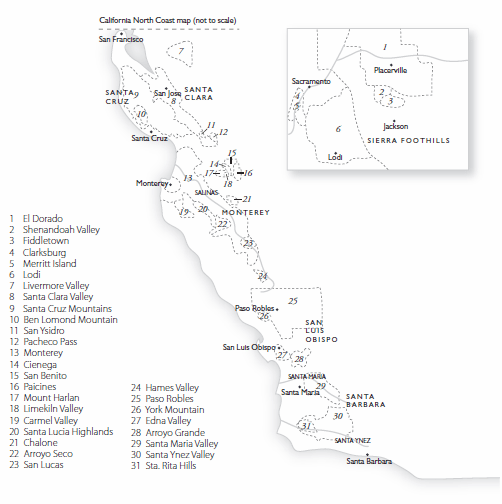 On the coast just to the south of Monterey are the Carmel Valley and, further inland, the Santa Lucia Highlands AVAs. The former has a surprisingly protected balmy climate and Cabernet Sauvignon and Merlot are successful; the latter is a source of some of the most impressive recent bottlings of Pinot Noir, some of it very pricey indeed. A number of top producers have sourced from the highly regarded Pisoni Vineyard. To the east of Soledad and the Salinas River is the tiny monopole appellation of Chalone. First-class Chardonnay, Pinot Blanc and Pinot Noir are grown here. Going south down the Salinas Valley from Soledad are the AVAs of Arroyo Seco and San Lucas. Santa Cruz is the principal AVA taken for the best wines, stretching across these two counties. The area includes a whole range of mesoclimates and runs from the southern San Francisco Bay south to Santa Cruz and inland southeast almost to San Benito County, which has just one winery of note (Calera) and the tiny Mount Harlan AVA. Chardonnay and Pinot Noir are successful in Santa Cruz as well as warmer-grown Cabernet Sauvignon. Two of California’s great reds originate here: the Ridge Monte Bello and Katherine Kennedy Cabernet Sauvignon. The huge geographical area of the Sierra Foothills encompasses Amador County and stretches into the Sierra Mountains. The AVAs here are El Dorado, Fiddletown and the Shenandoah Valley. The area is mainly a source of top old bush vine Zinfandel but a number of Italian varieties, particularly Barbera, also enjoy some success. It is also a very important source of top quality Rhône styles and varieties. To the south is the giant irrigated Central Valley, heart of California’s vast bulk wine industry. To the far south towards San Diego is the region of Temecula but no real wines of note have emerged.